Note: If you have already worked through the Changing the LEAD HTML5 Medical Viewer to use a Different Database Schema tutorial, then you should first work through the Restoring the LEAD HTML5 Medical Viewer to its Original State topic of that tutorial. 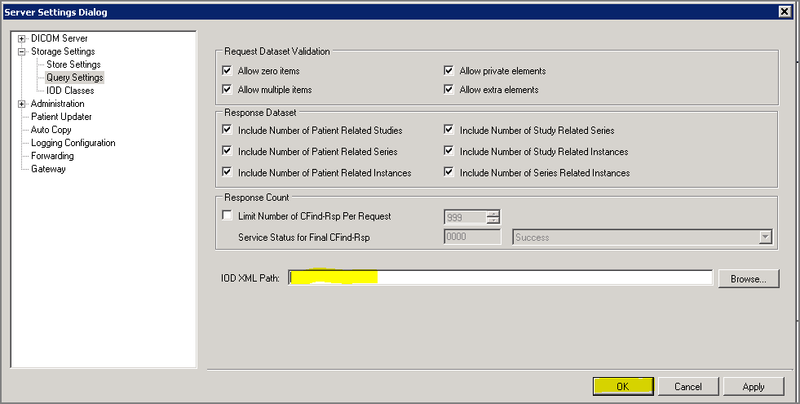 Open the Query Settings, and clear the IOD XML Path so that it is empty. Comment out the myStorageDataAccessConfiguration175 section. The new section is highlighted in yellow below. Un-comment the existing StorageServer entry in the storageDataAccessConfiguration175 definition, and comment out the new myStorageDataAccessConfiguration175 definition. The changes are highlighted in yellow below. Un-comment the existing StorageServer entry in the forwardConfiguration175 definition, and comment out the new entry that references MyDicomDb. The changes are highlighted in yellow below.